The young ASICS Easter Bowl Giant Slayer was at it again on Friday as Cincinnati’s Caty McNally shocked the top-seeded player in the ITF girls’ singles division for the second straight year. McNally, playing her singles match in front of USTA Director of Coaching Jose Higueras and USTA Head of Women’s Tennis Ola Malmqvist, also advanced to the doubles semifinals. 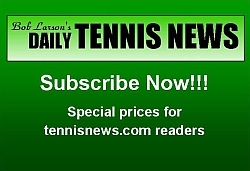 Her brother John, the 2014 16s ASICS Easter Bowl champion, joined her in the semifinals, as he won his boys’ ITF singles match by toppling last week’s Carson USTA International Spring Champion Liam Carauana, 6-4, 7-5. Caty McNally was happy to escape the match just minutes ahead of a downpour that led to a nearly three-hour rain delay. “When the lines were getting slippery I was just like, ‘Oh, no. I do not want to stop. I’m playing too well,’ ” she said. Caty will face No. 13-seed Ellie Douglas in one semifinal starting at 10 a.m., on Saturday while No. 8 Alexandra Sanford will meet unseeded Hanna Chang at the same time. John McNally, the No. 4-seeded player, will take on No. 6 Vasil Kirkov in a match to follow. Top-seeded in doubles with his Cincinnati partner J.J. Wolf, John teamed with Wolf to reach the doubles semifinals, while Caty fell in her quarterfinal doubles. 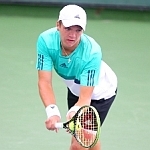 In the boys’ 16s singles final, top-seeded Carson Haskins of Ballwin, Mo., forced a third set right before the rains came, and then returned three hours later to beat a game opponent in No. 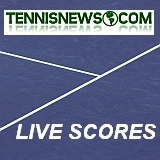 11 Lukas Greif of Evansville, Ind., 4-6, 6-3, 6-1. 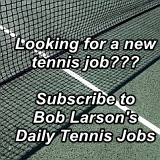 Haskins, who has trained at the Miller Tennis Academy in Chesterfield, Mo., since he started playing tennis seven years ago at age 9, still plays high school tennis. “I go home and then I think I have a match on Monday,” he said. Haskins said he checked out the past ASICS Easter Bowl 16s winners online on Friday, and saw former USTA Missouri Valley Section junior star and current U.S. Davis Cup player Jack Sock (2008) among the past winners. In the girls’ 16s singles final, No. 7 Angelica Blake, 15, of Boca Raton, Fla., outlasted No. 8 Abigail Forbes of Raleigh, N.C., in straight sets, 6-2, 7-6 (3), before the rains came. Elysia BOLTON (USA) / Chiara LOMMER (USA) def. Devon JACK (USA) / Kalani SOLI (USA) 1-0 Ret.